Living with a child with Attention Deficit Hyperactivity Disorder (ADHD) can be overwhelming and frustrating. Often the child with ADHD do not ‘hear’ parental instructions, and hence do not obey them. They’re also often disorganized and easily distracted. They may start projects and forget to finish them or clean up after them. Children affected with ADHD-related impulsivity often interrupt conversations, speak before they think, and demand attention at inappropriate times, saying embarrassing things. It is also often difficult to get them to bed and to sleep. Research shows that up to 70% of children with ADHD suffer from sleep-related problems. Hyperactive children may also tear around the house or do things that put them in physical danger. However, there is a lot that can be done by parents, to control and reduce the disruptive symptoms of ADHD. The earlier you address the problems, the easiest it is to deal with it, and the greater chance of success your child has. Parents should set up, from the time children are young, specific times for waking up, eating, playing, doing chores, doing homework, watching TV or playing video games and going to bed. Also, let your child know the rules of the house, such as ‘No Bad Words’, and let him/her know the punishment for breaking rules. No hyperactive child can sit cooped up in one place for any length of time. Parents should provide toys, games, motor activities and opportunities that will give them enough physical movement. Children with ADHD may benefit from martial arts training or yoga, which enhance mental control as they work out the body. They need a lot of loving physical contact. Parents should ensure this by touching them, hugging them, tickling them, and wrestling with them. Caffeine, artificial colourings and additives as well as excessive sugar may worsen ADHD symptoms. Steer clear of them. As a rule, avoid junk food and fizzy drinks. As far as food, eat home-cooked meals. Parents will have to make sure that a child with ADHD has a calm and structured bedtime routine. This will help them to get ready for sleep. About 30 to 60 minutes before bed, a number of activities should be avoided e.g. mobile phones, computers, console games, TV and other stimulating activities. There should not be televisions or phones in the bed rooms. Reading stories and some deep, slow breathing can help children to relax at bedtime. Children with ADHD do not often ‘hear’ what their parents say. They are too distracted. Therefore, before you instruct your child to do anything, get his attention by looking into his eyes. Then, in a clear and calm voice, say what you want him to do. Keep your instructions short and simple. Then, ask your child to repeat what you just told him. In the case of difficult tasks, give only one or two instructions at a time, and congratulate your child when he completes each step. Watch them at all times! At home, make sure that someone watches your child all the time. Since they are impulsive, children with ADHD are likely to get into risky situations. Even when they play with friends, it is wise to keep a look out. Don’t allow hitting, pushing and yelling or any kind of bullying. Parents should take care to select playmates very carefully for such children, because it is hard for them to learn social skills and social rules. It is better to invite only one or two friends at a time in the beginning. School mornings are typically difficult for children with ADHD. Parents should ensure that everything necessary for school – school uniforms, books and bag – are ready the night before. There should be enough time for kids to get dressed and have a good breakfast. To provide time for this, make bed time earlier than usual, so that they can wake up early. There should be time set aside for doing homework, and this should be consistently followed. It is important to realize that children with ADHD respond much better to rewards than punishment. Never ever try to shout your kid down when he is throwing a temper tantrum, or is disobeying. Be quiet, and it will get to him after some time. Catch him doing the right thing and reward him, rather than looking for faults. Expect disruption and disobedience, and do not take it personally. Remember that ADHD brain is just wired differently. Dealing with ADHD is not easy. Thankfully, there are many support groups that offer professional help to parents in dealing with children with ADHD. It is important that parents, grandparents, other relatives, the school and teachers work hand in hand, to handle problem behaviours presented by ADHD. It is important for parents to ask for help and to join a local support group. ADHD is a brain disorder, and is inherited in the majority of cases. It is not caused by poor parenting, a particular school system or a particular home environment. It is, however, often seen then in a home environment where parents are very critical of their children, ADHD symptoms tend to worsen. Therefore, avoid self-blame, but make sure that there is a constructive and positive atmosphere at home. 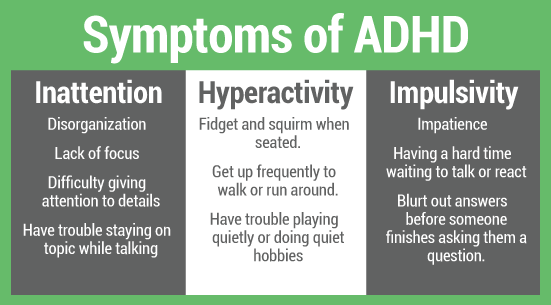 While ADHD cannot be cured, it can definitely be managed very well, and the child can grow out of it, given the right kind of support, medication, and a behaviour therapy program. What is needed is not blaming anyone, or being angry with the child, but a carefully studied method of handling the problem, with the help of a support group and a team consisting of parents, teachers, and medical professionals. Previous PostWhat to do when your kid says “I don’t want to go to school!”Next PostAging Therapy, Can Science Reverse Aging? My sister’s son has ADHD, and people often think that his antics are just him acting out. Because of that, it’s easy for teachers and even her as a parent to want to use punishment to try to correct his disruption and disobedience tendencies. I definitely agree with you about using rewards, however, but what type of positive consequence would you suggest? It helps to create a visual schedule for their morning or nightly routine. Use pictures of him doing the things there so it is easy for him to visualize himself following those expectations. Sticker charts work well, but keep it to 5 boxes at the beginning. Waiting too long is difficult and can seem unattainable. For example, earn a sticker each day you have a good day at school. Fill the sticker chart and I read you a special bedtime story.